The Barrie Welham Nymph was developed when Barrie needed a nymph that sank slowly for trout that were feeding a little below the surface. Creation of a new fly is often a development and variation of existing patterns. 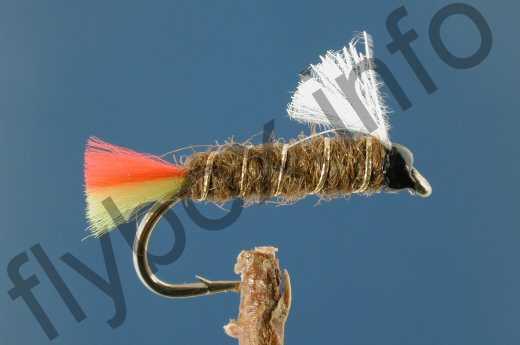 The Barrie Welham Nymph is a good example, it started life as a humble but very effective fly called the Brown Woolly, that was created by Lieutenant Colonel"Rags" Locke. Tail : Red and yellow DFM floss or flourescent fibres. Rib : Oval gold tinsel. Breathers : White hackle clipped short. Currently there are no comments about the Barrie Welham Nymph fly pattern from other fly fishermen yet.